Below is a comparison of territorial movements by the radio collared wolves across seasons for 2004 and 2005. Each data point was a GPS location for one of the three collared wolves, and there was a total of 1,060 GPS locations throughout the two year study period. The areas devoid of data points were the locations of mountain peaks. The collared wolves tended to stay in the drainage systems and use the extensive system of logging roads for travel. 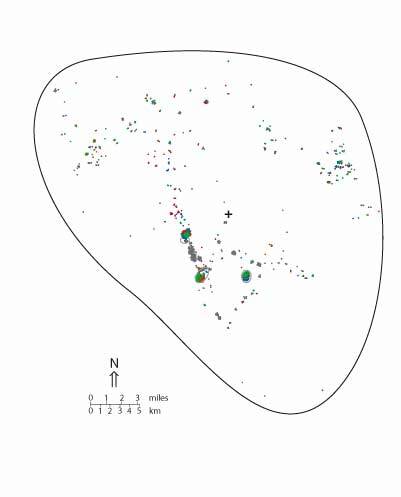 The collared wolves moved around their territory throughout the year, but there was a clustering of their locations during the denning and rendezvous site seasons. Notice that the den and rendezvous site areas were visited occasionally throughout all seasons (see Travel Routes). The approximate territory size for 2005 was 953 square kilometers (368 square miles). Throughout the year the wolves certainly got around, with concentrated use at the den and rendezvous sites.